Every August the Fall Outdoor Education season officially begins when the Eisenhower school buses roll down the hill into River Village. 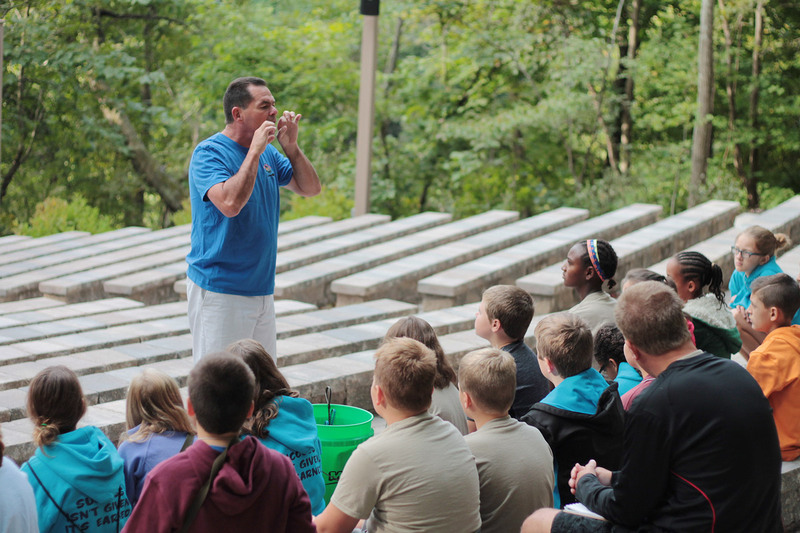 For 21 years, Eisenhower’s fifth graders have has explored the natural world as part of the Earthship Journey program and principal Chris Gensinger has been a part of every single trip. 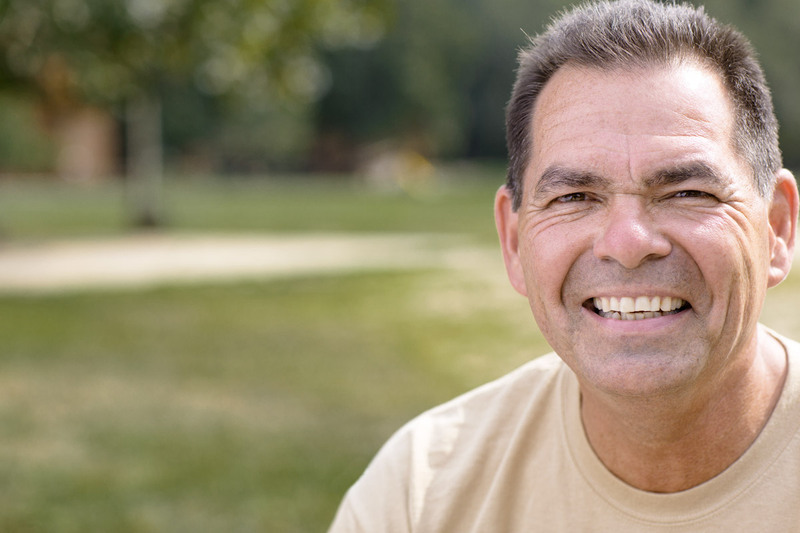 We sat down with him to talk about the impact Camp Tecumseh has on students and staff, and what makes the experience so special. CT: You guys have been coming to camp for over twenty years now. I think this might be our 21st year at camp. We tried an experience before we came here, but it wasn’t the kind of rich experience we were looking for. One of my teachers heard about this camp and we’ve never stopped coming. It’s been exactly what we’re looking for. CT: What is it about the Tecumseh experience that keeps bringing you back? We love Outdoor Education but it’s more than that. We want our students to have life experiences, and t meet the staff and see how they provide role model behavior. We want them to go away with a memory of our elementary school and Camp Tecumseh that they carry forever, and that’s happening. We’ve never found a place like Tecumseh. We have some programs very close to our school but they don’t provide the same connection to the kids or the curriculum as here. The way it’s delivered here is outstanding. It’s something the kids remember, take with them, and transfer to other things. That’s important. CT: In all your years of doing this, how does the camp experience effect what happens back at school? Really it comes up often. It can be in science class or math class; it can come up in a variety of places, even in our lunchroom. Some of the things that happen here, the life lessons they pick up, transfer into many other things. Clearly, it comes up for months afterwards. We keep the pictures of the camp experience up on the wall all year and it excites the kids who are about to come up into the next grade level. They get excited to have this outdoor experience. CT: Planning the trip and deciding dates is just as important as figuring out where to go. You come at the beginning of the year. What’s the rationale? It’s another thing that this camp does really well. Our kids don’t know each other very well at the beginning of the year; they don’t know their teachers. Building relationships is a big deal. It’s part of our curriculum in the earthship code. It helps kids see their teachers and principal with their hair down. It lets the kids see us as real people, like their moms and dads. They learn more about each other. 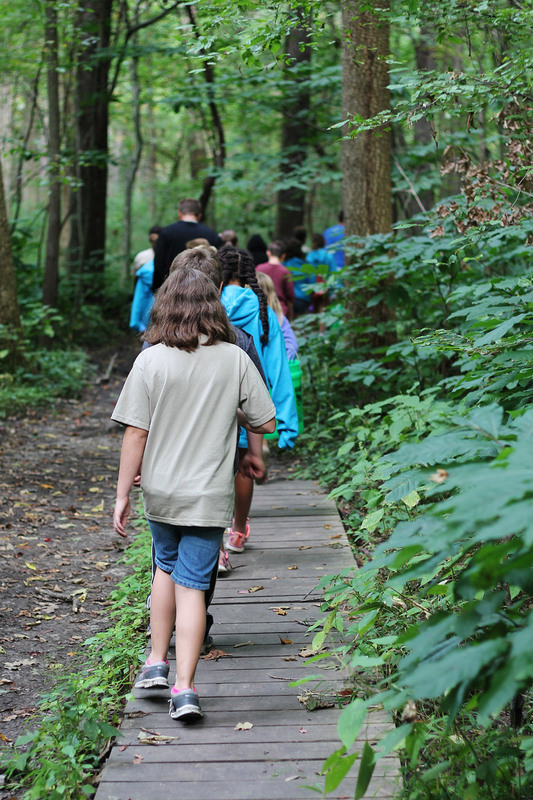 We develop the trail groups, the table groups, and the cabin groups so they interact with kids that they ordinarily wouldn’t interact with and some lasting friendships occur from it. The relationships with their teachers are better as a result of it. We do it early so we set the tone for the rest of the year. CT: How about parents. Do you see the parents around more after a trip like this? Do you feel more connected to the community? It builds trust between parents and us. We don’t have any parents on the trip with us. It’s all staff. One of the things we want the kids to learn is, you’re going to be okay away from home. They are 5th graders, it does work out really well. Sometimes it’s harder on the parents, but they’re so appreciative when we get back and their child had a really great time away from home. It also gives mom and dad a chance to be by themselves for a little bit. It’s a win-win. It does help us, even if there are negative things that occur with students, the parents have more confidence in us, they appreciate us. I think it has a lot of residual positive effects. CT: How does the OE experience fit into your regular curriculum? It’s just a great enhancement. I believe in immersion. Getting their feet wet. Whatever it takes. They get a lot of that here. It’s much more difficult to make something this lifelike back at school. This is a real experience that enhances what we do at school. We can have some virtual experiences in the classroom that are similar, and we do as much as we can back at school, but nothing beats this because they are right in it. 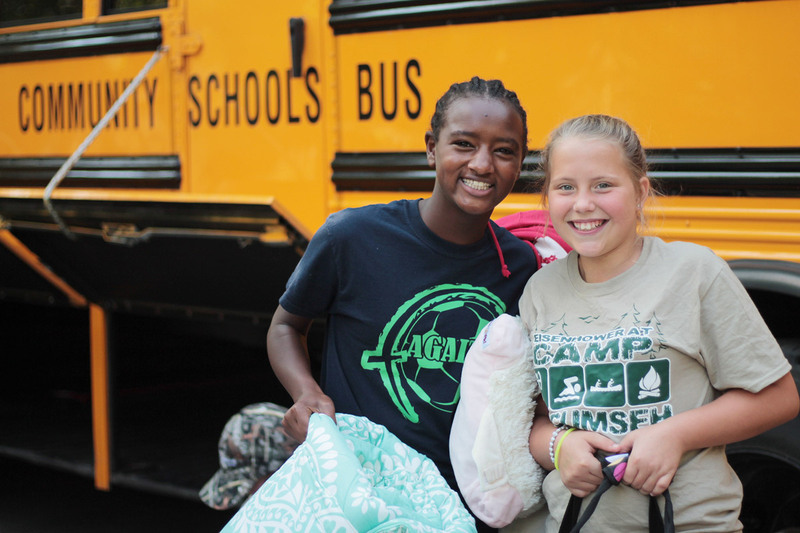 CT: Personally, what do you take away from a Camp Tecumseh trip? We draw closer as a staff. We also build relationships here. We’ve never gone away not feeling great about our staff and the folks working directly with our kids. That’s something we didn’t get other places. We really like that combination. But my staff, I have staff members waiting in line to take our kids. I always take our 5th grade teachers and there are others who drop what they are doing to attend. We get subs, and they get to have an experience like this so they can see how, rich it is. It’s good for me too. I really appreciate my staff. CT: You’re actually out teaching the trails. You teach Ghost Creek. What about Ghost Creek do you like so much? I love Ghost Creek. I really love the collecting of specimens. I love the idea of the teaching gifts. Gifts is one of the parts of the eartship code. I love that the best. The beaver board example for the kids shows how many different gifts an animal can have. They also realize that it’s not just about animals. People have different gifts and they need to appreciate and understand those too. It’s a really great experience for them on that trail. There are so many things they can transfer in real life. It’s not just about animals. I really like the message they get from Ghost Creek. 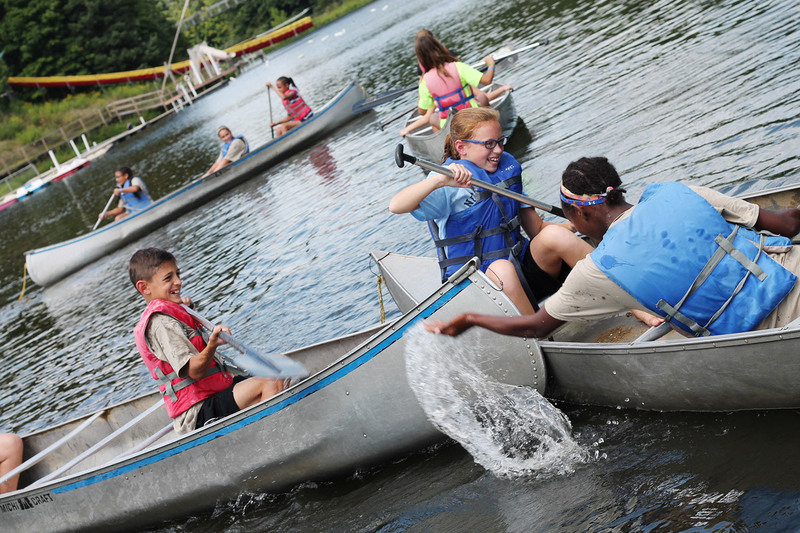 CT: What advice would you give teachers who are debating coming to Camp Tecumseh? It’s not about the curriculum. We can probably get the curriculum anywhere. It’s the personal touch here. We’ve been other places, it’s not there. This has it all. We’re not willing to experiment with anything else at this point, and I don’t think anyone else should either. We’ve never had a down year. I think 21 years of success speaks for itself.